Dwight Worden, retired Air Force major and former KC-135 Stratotanker pilot, discusses the aircraft, then and now, with Maj. Nick LaPlant, test pilot with the 418th Flight Test Squadron. An 85-year-old retired Air Force major got a chance to revisit his favorite aircraft four decades after he retired from the U.S. Air Force. 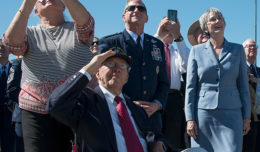 Retired Air Force Maj. Dwight Worden boarded a KC-135 Stratotanker at Edwards Air Force Base, Calif., June 13 during an informal tour to celebrate the retirement of his son, Jim Worden, an engineer with Detachment 5, Air Force Operational Test and Evaluation Center here. Jim Worden’s retirement ceremony, after a 36-year civil service career, was June 6. Jim Worden said his father’s career did have an influence on his own. “Growing up as a dependent, I was around the Air Force my entire life,” he said. “But I didn’t go in the Air Force, because I didn’t see that they had a need for engineers,” he said. But then he got a civilian job at Edwards Air Force Base. “The variety, the technical challenges here, and the people, are what made my career,” he said. Jim Worden worked instrumentation on the KC-135 early in his career at Edwards. 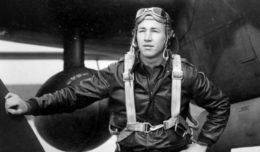 Dwight Worden flew the KC-135 for the Air Force when they were added to the inventory in the 1950s. Prior to that, Worden flew the KC-97 Stratofreighter, the older, propeller-driven version of the Stratotanker. 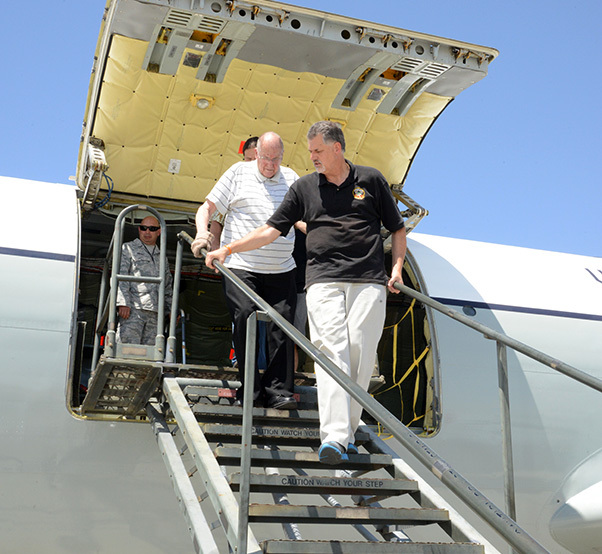 Dwight Worden and his son Jim Worden depart the KC-135 Stratotanker after a tour and discussion with crewmembers. Jim Worden retired Monday, almost exactly four decades after his father. 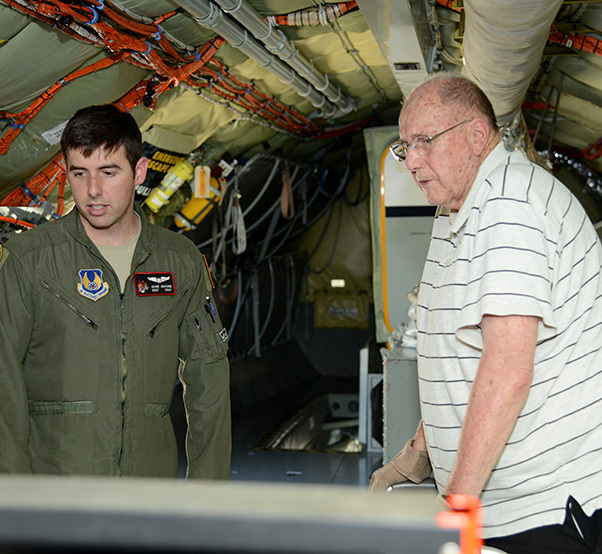 During the senior Worden’s tour of the aircraft, he had a chance to speak with Maj. Nick LaPlant, a test pilot with the 418th Flight Test Squadron, and SSgt. Adam Joachim, a test boom operator with the 452nd Flight Test Squadron. They spent some time discussing the differences between the aircraft from Worden’s time and the same aircraft now. “I was surprised at the amount of changes made to the aircraft,” Dwight Worden said. “The KC-135 was my dad’s favorite plane. Today was not just the thrill of the day for him. It was more like the thrill of a generation,” Jim Worden said. SSgt. 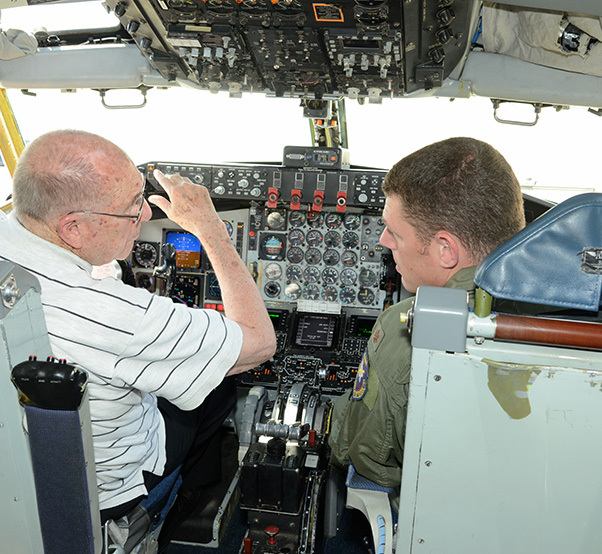 Adam Joachim, a test boom operator with the 418th Flight Test Squadron, describes the data-gathering systems and boom operations on a modified KC-135 Stratotanker to retired Maj. Dwight Worden. Worden flew KC-135s for the Air Force when the service was transitioning from the KC-97 in the 1950s.